What makes a city the way it is? How did and do residents live in Frankfurt? What relationships do they have with neighbours and strangers? The permanent exhibition Frankfurt Once? will address these questions and many others. The city’s history will be examined for its special logic and its changing identities and attributions over 2,000 m2 of floor space. It does not follow any chronological tour through history, but rather is separated according to the characteristics that defined Frankfurt in the past and continue to define it today. The exhibition can be experienced anew over and over again: In some sections, the exhibits are changed on a regular basis. “Tour maps” create new insights into the city time and time again. The family activity trail is aimed at young visitors and their families. Interactive elements continually provide access to the highlights of the exhibitions regardless of (dis)ability. “Frankfurt Once?” was designed and set up by the museum team along with museographers arge Gillmann + Schnegg from Basel. 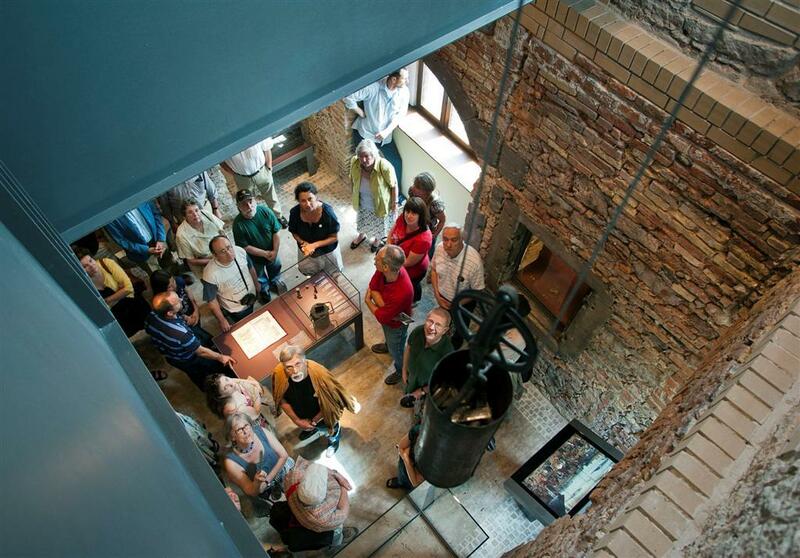 The entire length of the ground floor in the exhibition house is used to provide a concise and entertaining overview. Events and prominent people spanning a period of over 1,000 years are represented by 100 objects arranged in chronological order. The gallery “100 x Frankfurt” condenses objects and history into one complex city history and puts the highlights of the collection into new contexts. “100 x Frankfurt” is special as it links objects closely with their history. What does a golden lidded goblet have to do with an umbrella or the Frankfurt kitchen? All of the objects have in common that they and their history have influenced certain eras in the city’s history and thus became part of the collective memory of the city. This means that the English Monument is not simply a golden lidded goblet from 1558/1559, but also stands for migration processes. 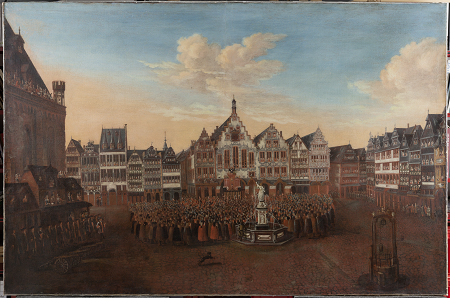 English Protestants who had to leave their country presented it to express their gratitude for Frankfurt’s hospitality. 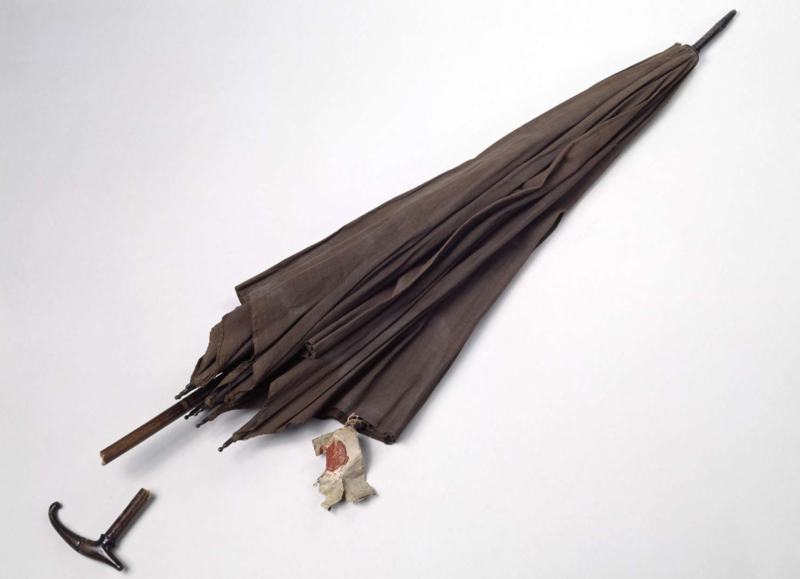 The umbrella stands for a personal destiny and for a national movement: Henriette Zobel was thought to have used it to take part in the murder of a parliamentarian of the National Assembly during the September uprising of 1848. 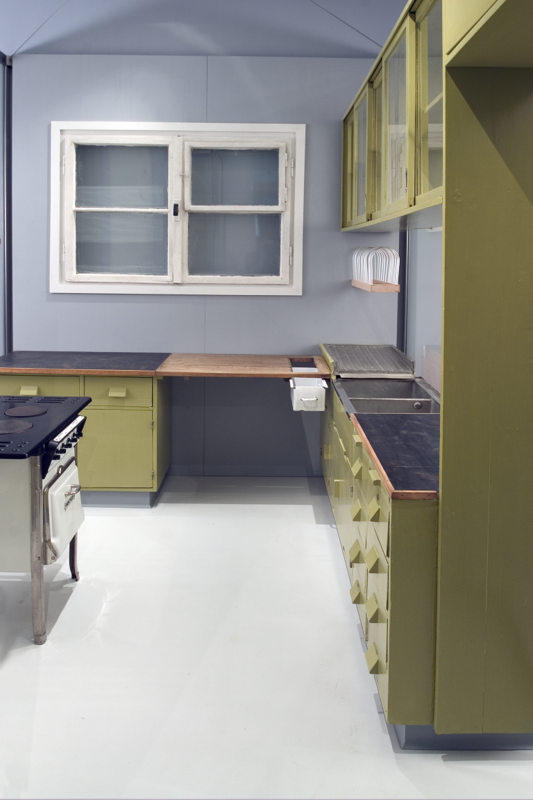 The Frankfurt kitchen refers to the 1920s, when Ernst May, director of the Housing Department, created several new types of urban settlements dubbed the “New Frankfurt”, which served as role models. Austrian architect Margarete Schütte-Lihotzky designed the functional kitchen for these; it was built into the flats of the “New Frankfurt” over 10,000 times and is considered the original version of the built-in kitchen. The gallery “Town Scapes” forms the start of “Frankfurt Once?” and aids in orientation in the city in the past and present. Right at the beginning of the tour the model of the Old Town by the Treuner brothers can be seen: The colourful houses are clustered together side by side and give the impression of an intact, even idyllic Old Town, which was once one of the most striking symbols of Frankfurt. But did this idyll really exist? How did the city develop over the centuries? 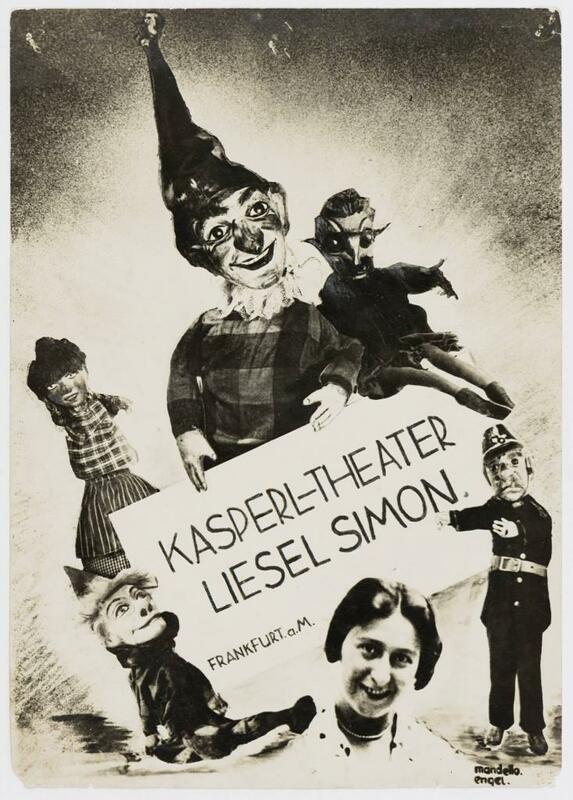 How was the image of Frankfurt characterised? The “Townscapes” confront these questions as well as many others. They are images that the city produced itself or helped to produce. The three sections “Frankfurt from Above”, “The Old Town Drama” and “Portraits of the City” continue to provide new insights into the city. 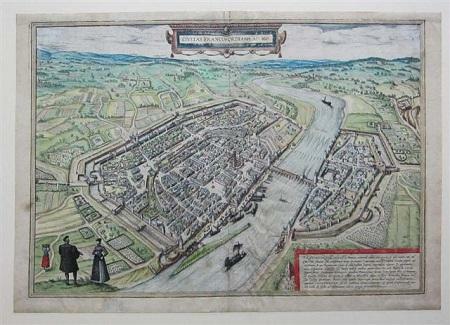 The section “Frankfurt from Above” shows how Frankfurt was constituted and developed itself with views and maps of the city from the 16th century to the present day. The maps help make visible the major periods which have characterised the city from past to present. It begins with maps from a birds’-eye view from the south-west, then proceeds to views of the fortified city and finally to the latest skyscraper blueprint. The “Old Town Drama” highlights the many discussions that took place from around 1860 about the “correct” appearance of the Old Town. The discussion mainly went back and forth between the two opposing sides of preservation and modernisation. Especially after the destruction of the Second World War, the Old Town provided a large projection area for urban planning. The giant model by the Treuner brothers thus served as a practically inexhaustible reservoir for the construction of vivid memories. The squares, streets or views of the Main riverbank presented in “Portraits of the city” create a broad picture of Frankfurt in the past and present. 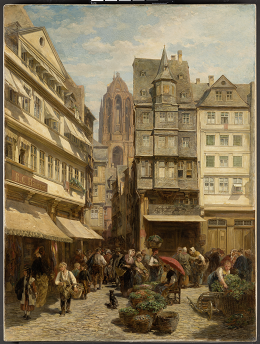 Both “classic” perspectives of Frankfurt which were painted anew over and over again at particular times and contemporary painting styles, which were also taken up in Frankfurt, are represented in the collection. Here visitors will find one of the highlights, the “Fahrtor am Mainufer” (City Gate at the Main Riverbank) by F. W. Hirt. The two huge city panoramas by Karl Sager (homages to painter Karl Georg Enslen) are also presented here for the first time. Between 1847 and 1849, Vienna painter Karl Georg Enslen (1792-1866) stayed in Frankfurt many times and created two panoramas of the city. One of the panoramas is from the perspective of the tower in the Deutschordenskirche and provides a wide view across the city: The half-panorama – nearly five metres wide and one metre high – shows a panoramic view of Höchst in the west to Offenbach in the east and provides a detailed panorama embellished with several scenes from everyday life. Innovations of the time can also be seen, such as the newly built railway bridge over the River Main or the “paddle steamer” on the channelled Main. The second panorama shows the Zeil from the tower of the Katharinenkirche. 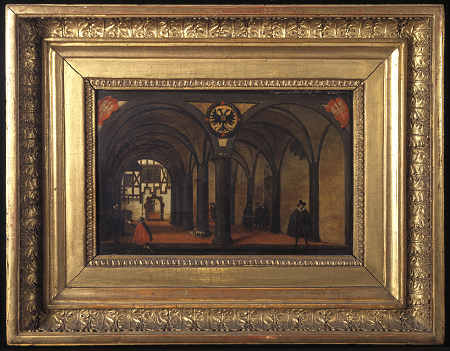 The two panoramas were likely exhibited as a big attraction in the Sächsischer Hof in Schäfergasse together with other panoramas by Enslen. Enslen was a “travelling artist” who lived off exhibiting his panorama paintings in different European cities. 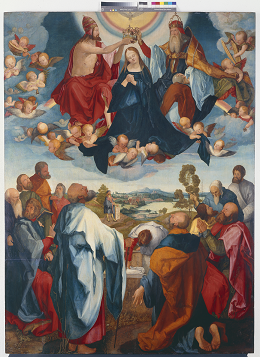 Enlsen’s adoptive son later sold these and other works to the “Lübecker Gesellschaft zur Beförderung gemeinnütziger Tätigkeit”, and they then ended up in the Lübecker Museum. 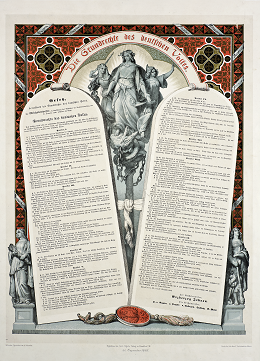 Parliament representative Carl Funck donated a copy created by Lübeck painter Karl Sager around 1909-1910 to the Historisches Museum Frankfurt. In the alternating gallery “Change of Perspective”, photographers take a look at the city of today. The “Civic City” gallery raises the question: Who actually “makes” the city? And: Who takes part in the important decision processes; who does not? It is particularly interesting to ask these questions in Frankfurt, as it has always been a city of the people and not of nobility. The city was and still is sustained through individual citizens as well as associations, foundations and societies. In the “Faces” section, the focus is on individual biographies. Some of them are looked at in more detail in the “Biographies”. The “Societies” section sheds light on the associations and societies that characterised the city in the past and still characterise it today. A portrait wall with paintings, sculptures, drawings, prints and photographs shows portraits of Frankfurters from all levels of society from the end of the 15th to the 20th century. The wall is in constant movement as some of the drawings, prints and photographs are swapped regularly due to their sensitivity to light. In the media station there is information about the biography and networks of the people portrayed as well as about the participating artists and the various portrait genres. 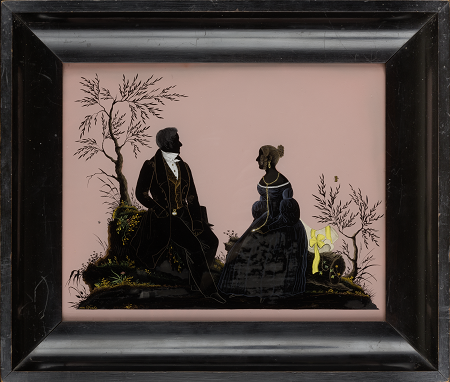 In the “Life stories” cabinets, the lives and work of individual people can be traced. These are also changed on a regular basis. Visitors can choose which people they would like to get to know better. The cabinets of Walter Schreiber and Margot Frank form a permanent core; they stand for the different life journeys during the time of National Socialism. association boxes which present the history of various Frankfurt groups such as classic associations and citizen’s initiatives. Money is Frankfurt’s unique selling point: In the gallery “Money Town” in the first floor, visitors can discover the varied history of Frankfurt as a trade fair city of the empire and address the subject of the city as a European financial centre of today. “Empire of Coins” focuses on funds and “Stories about Money” on its notions. The “Financial Center” highlights persons and institutions, whilst trade cycles are the focus in “Up and Down”. Over 3,000 coins appear in “Empire of Coins” as a vast sea of coins. 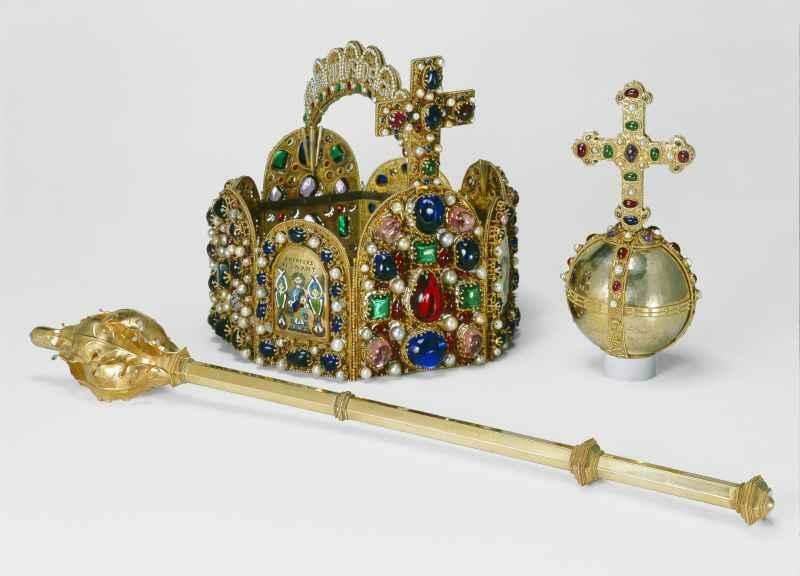 They represent the more than 300 mints of the Holy Roman Empire and the German Confederation (up to 1866). All coins were also traded in Frankfurt. In the “Stories about money”, the dazzling significance of money is the focal point. It examines the complex relations that the doll’s house from the Gontard family or the Heller altar from A. Dürer may have to money: on the one hand, there was economy, which needed to be learnt, and on the other hand salvation, which merchants hoped to buy in this manner. “Financial centre” focuses on the players of the city of money, the bankers of the past and present and their institutions. The private bankers of the 18th century are up against the bankers of today. Both characterised the city’s image on many levels. The architecture of many skyscrapers is visible to all as well as the only skyline in Germany to feature them. “Up and down” follows the trade cycles from the 16th century to the present. The global upturns and downturns of money flows also had an effect on life in Frankfurt. The gallery “Global City” shows visitors the role of Frankfurt as a central place of German history and as a secret capital city. 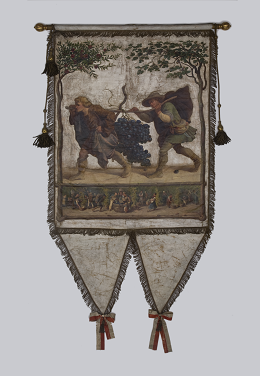 “The Emperor Makers” focuses on Frankfurt as a city of election and coronation. “Representatives of the People” evoke the democratic awakening, which reached its high point in 1848 through the national assembly in the Paulskirche. “Crossings” thematise Frankfurt’s role as a transport hub. “Communication” highlights the city’s diverse relations to publishers, books and writing. The central location and the expansion of roads were reasons for the economic success of the city beginning in the Middle Ages. “Crossings” splits up its various functions as Germany’s most important hub for roads, rail, aviation and data traffic. The “Adler-Autobahn” presents one of the first streamlined cars. From 1562 to 1792, not only were kings and emperors elected in Frankfurt, but also ten “Roman-German” emperors. “Kaisermacher” emphasises the never-changing spectacle of the coronation on one revolving stage. On 18 May 1848, the first German parliament – the National Assembly – gathered in St. Paul’s Church. Around 500 parliamentarians met here as elected representatives, who also gave the title to this gallery area. “Communication” highlights how Frankfurt became a city of book, print and publishers. Here, visitors can see one of the highlights of the museum: The 1515 globe by Johannes Schöner on which the new world “America” is marked.